Do Non-Slip Dog Socks Really Work? We had a few issues this past week with dogs slipping and getting injured so I decided that it was time to figure out ways to protect Sherman and Leroy more than I have in the past. My first decision was to look into buying non-slip dog socks. The reason that I was looking into the socks initially was because Sherman and stumbled in the driveway and one of his nails fell off. It was a bloody nightmare and his paw required a bandage wrap for a few days to allow the area to stay clean and heal without him licking it every few seconds. Due to Sherman having SLO (Symmetrical Lupoid Onychodystrophy), he has lost nails in the past so we have a pretty good protocol in place but this one was a little different because it bled so much. We did all of the necessary cleaning and treatments but since rain was in the forecast for a few days we needed to keep the paw wrapped and dry. Usually, I use a dog to put over the bandage but this time the bandage was a bit too thick and the boot wouldn’t easily go over it so I needed to search for an alternative. I bought a pair of non-slip human socks with the grips on the bottom but those were a little too loose and Sherman wasn’t very secure with walking them. They worked for a day but then I decided to order a pair of non-slip dogs socks off of Amazon. By the time they arrived Sherman’s bandage was off and he no longer needed a sock but as bad luck would have it, Leroy had pinched a nerve in his neck the day before. He was in a lot of pain and not moving well. It was a struggle for him to get up and he couldn’t move his head to the left. It was hard to watch him struggle and we assisted him as much as he needed. The next day he started to feel a little better so I tried the socks on him. I was amazed at how well they worked for him. In this video, it shows the difference of him getting up with and without the non-slip dog socks. There are 3 videos combined and each video was taken within minutes of each. The second video is a little hard to watch but it shows his struggle. I should add that this is not how Leroy looks all the time when he gets up but on this day he was still sore from the pinched nerve. I did the third video of him wearing the dog socks because I wanted to make sure he was in the same position and that the first video wasn’t a fluke. Do Non-Slip Dog Socks Work? We’ve had these socks for 6 days and they definitely work well for Leroy but they did not work well for Sherman. I’ve been studying these back and forth on the dogs for the past several days and they work for Leroy’s issue of sliding when he gets up. Even though we keep both of the hair on their paws trimmed well, Leroy tends to slide with all 4 paws, especially his front paws, when he gets up on our laminate floor. He has trouble getting his back legs planted underneath him when he is in a sitting position. When he gets up he’s strong in the knees but he kicks out a bit. Leroy is stronger in the rear than Sherman but Sherman doesn’t struggle to get up. Sherman is stable in using his front paws when he sits up. His front legs rarely slide off to the side. However, Sherman is weak in the knees which makes him walk lower. The socks were just making it worse for him and he was walking lower and they kept sliding down. So my answer would be that it all depends on the dog and what their issue is. Non-slip socks will not work for every dog but they make work well for some. 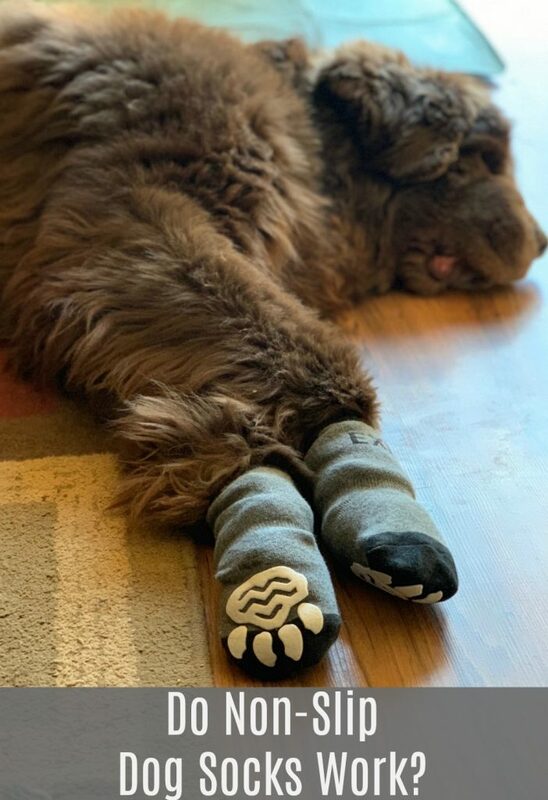 Do Non-Slip Socks Fit Big Dogs? Yes. We ordered the XL socks and Leroy has ginormous front paws and they fit well and are easy to put on off. The socks that we got did come with strips of black vet wrap to secure the socks so they don’t flip over or fall off. Can dogs wear non-slip dog socks all the time? It’s not recommended to keep the socks on 24/7 but you can keep them on for several hours. Leroy has been wearing them mostly when he is upstairs with us because that is when he struggles the most to get up. I don’t leave them on when he goes outside but I have left them on overnight because he tends to get up and move several times during the night. For us, if I don’t use the vet wrap than the socks do move and the grippers wind up on the top of the paw instead of on the bottom of the paw after awhile. Stealth mode! I can’t Leroy walking when he’s wearing the socks! Leroy shuffles and walks hard when he walks and I always know where he is because of this. When he’s wearing the socks I can’t hear him and that’s scary because he’s known to wander the house looking for loose food. The socks seem pretty well made but I’m not sure how long they will. I’ll update this post the longer we have them. Soft Claws – A fellow Newfie owner uses these nail caps but they don’t use the glue to adhere the stickers to the nail. They did state that they do fall off sometimes but they work well for their Newfie. Ultra Paws Rugged Boots – These work well outdoors as well as indoors and the 2 Newfie owners said that they use them on the back paws only. Dr. Buzby’s Toe Grips – We’ve used these before and they worked well but with Sherman’s nail issue he wasn’t able to use them. RC Pet Sport Dog Socks – These interest me. They have grips all the way around instead of just on the bottom. I just don’t know if I could stretch the cuffs wide enough to fit over a Newfie paw. 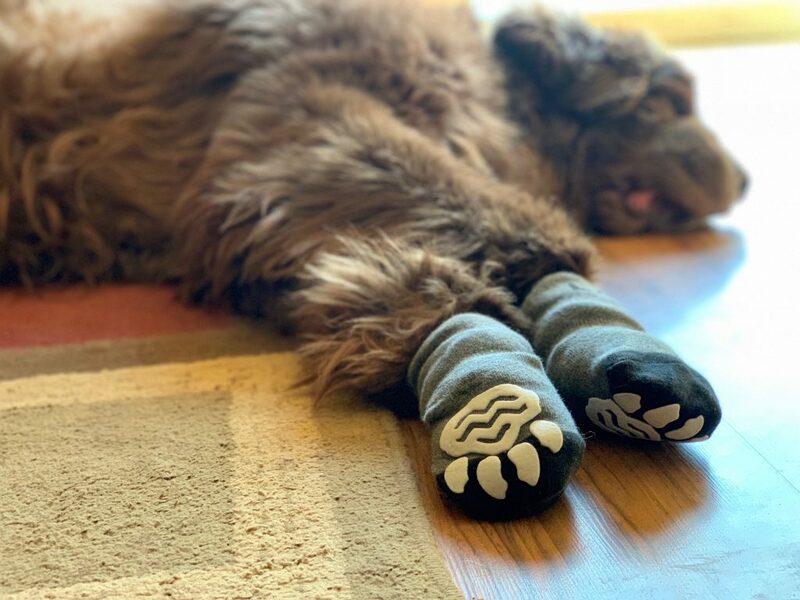 We purchased the Expawlorer Anti-Slip Dog Socks on Amazon. They have a variety of styles made by different brands many brands do not come in a size big enough for Newfies. Since it’s a product we used and approve of, I’ve added them to our Amazon Shop. I also checked several local pet stores but none of the stores carried non-slip dog socks in big sizes but they did carry several styles that would fit my finger. While these did not work well for Sherman, they are working very well for Leroy so I’m glad that I took the chance and ordered them. We used socks for three of our late dogs who had hind leg issues, and they were a big help. Plus they just look so cute with them on! Sweet story – we used to let our beagle Kobi wear them outside, and he would often come in with one missing! Long after he passed on, I would find stray socks around the yard or house. It always brought a smile along with a tear! Looks like a great product. I know Elsa could use them at times, her front feet slip on hardwood and tile floors. Thanks! Yep! It seems like Leroy has always been a little uncoordinated with his front and even more so now that he’s older. 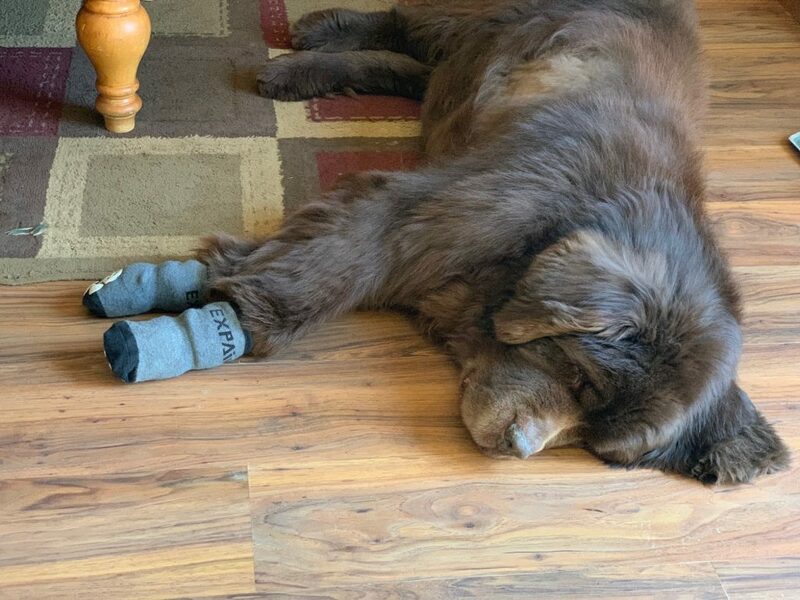 I used the doggie slipper socks for Shadow on occasion – when her arthritis was most bothersome – but if I forgot to take them off before going outside with her, I’d always find at least one of them in the grass. The PAWZ boots only stayed on her if I put them over the socks. If I put them directly over her paws, they would fall off after one or two steps out of the porch door. The one time she broke her nail, I just covered the paw with a baby sock. I think they would come off outside here too. Funny story, my husband lets the dogs out in the morning and I told him that if Leroy has the socks on when he gets up that he has to take them off. I didn’t think he would but he did!